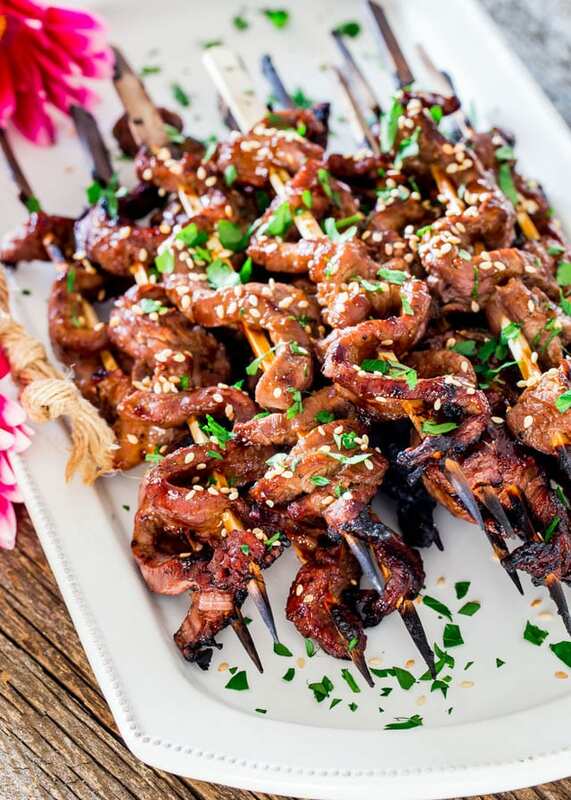 When these Beef Teriyaki Skewers are sizzling on your grill, the aroma will make everyone around you stop what they’re doing and come for a taste of these easy to make flank steak skewers with homemade teriyaki sauce. I hope you guys are all enjoying the long weekend and are staying cool. We just got back late last night from our little mini vacation and I’m exhausted, but was glad to sleep in my own bed again. However, today I’m still in holiday mode, so grilling it is. You can’t get any easier than with this recipe. I used a flank steak which I cut into very thin strips then threaded the beef on wooden skewers, which I then seasoned generously with salt and pepper. For the teriyaki sauce you simply throw all the ingredients in a small saucepan and bring it to a boil until it thickens nicely. All that’s left to do is to grill these skewers to your liking while brushing them generously with some of that yummy sauce. That’s all there is to these beef skewers and they are perfect for the long weekend. I served them with a salad but you can serve them over some cooked rice with some steamed veggies! 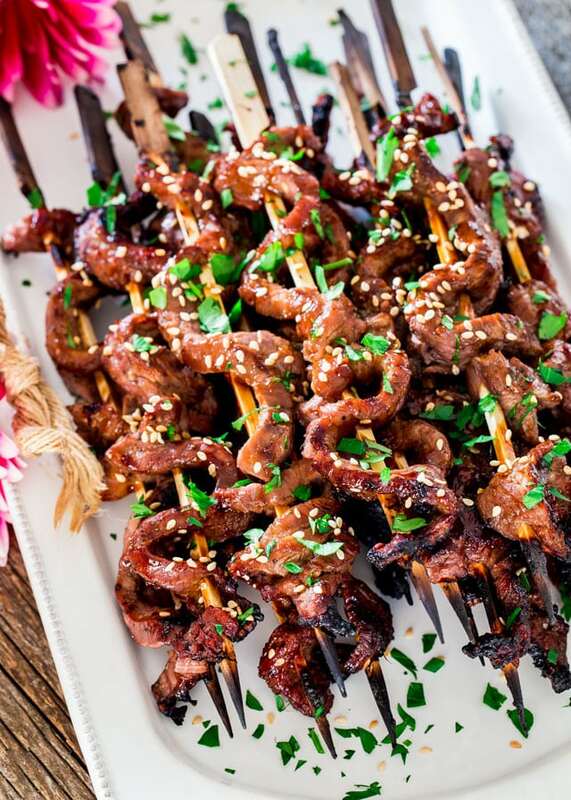 When these Beef Teriyaki Skewers are sizzling on your grill, the aroma will make everyone around you stop what they're doing and come for a taste of these easy to make flank steak skewers with homemade teriyaki sauce. Cut the flank steak across the grain into 1/4 inch thick slices. Season with salt and pepper. Refrigerate until using. Place the skewers in enough water to cover them and let them soak for about 10 minutes. In the meantime, combine all the sauce ingredients in a small saucepan and whisk. Place the saucepan over medium heat and bring to a boil while whisking. It should thicken. Remove from heat. 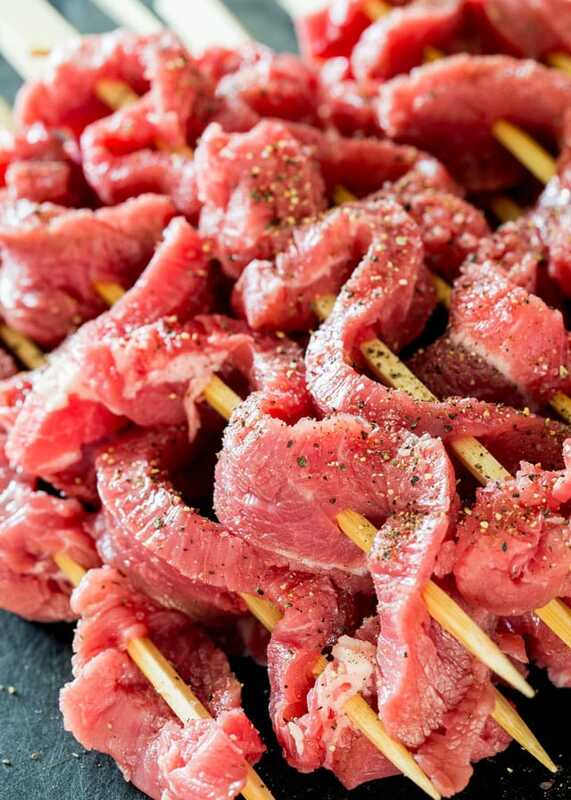 Thread the beef onto the skewers. about 2 pieces per skewer. Place the beef skewers on the grill over medium-high heat (350 F to 400 F) and brush generously with the prepared teriyaki sauce on both sides. Garnish with toasted sesame seeds and parsley, if desired. If you're having trouble slicing the steak thin, plate it in the freezer for 10 minutes before hand to make slicing easier. You can use any type of steak that you prefer. 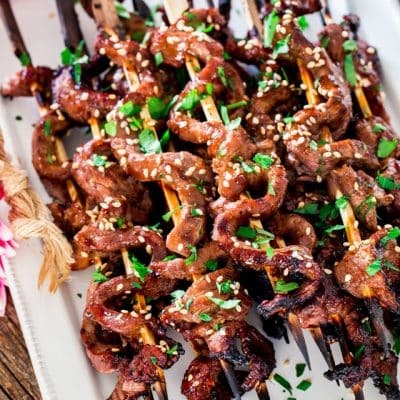 These skewers look amazing. I want to make them for an event that I am hosting. What are your suggestions on making ahead of time so I am not out grilling while the guests are here. Have you ever made them or prepped them the day before and heated them? You can make them ahead of time and heat them back up in a 450F oven for a few minutes until they’re warmed through. Thank you very much for this recipe, looks so delicious. Can’t wait to try it this weekend. Always fun to make skewers and these are yummy. Thanks for your comments and for being a part of the Jo Cooks community. I haven’t made these in forever. Partly because I lost my recipe. These look tasty! I’ll be using yours, haha. These look perfect for the grill today. We’re also smoking a brisket and friends are bringing the rest. Should be a fun BBQ. Cheers and thanks for these! We bought a smoker a little while ago and we smoked a brisket in it as well, so so good, love that smoker! These sound like a great addition to the BBQ today. We’re also doing a smoked brisket and friends are bringing the rest. Should be a fun day. Cheers and thanks for this one!